Based on the battle-proven Polish Beryl, this I.O. Inc. AK lands in America! Craftsmanship and modern upgrades redefine the 7.62x39mm Kalashnikov! Classic Cold War-era 7.62x39mm Kalashnikov reborn and ready for service! Interarms’ reborn version of this ultra-compact 7.62x39mm Cold War Classic! Magazine-fed, 12 gauge AK-style is enough to satisfy a “shotshell” enthusiast. Piece of History Firearms’ custom build of this classic AKM variant! Rediscover the Red Army’s truly unique combat diver’s arsenal! Tactical AK primed and ready to unleash 7.62x39mm fire and brimstone! The Israeli-designed rifle on the frontline for this Baltic country. Custom build’s enhanced ergonomics breathe new life into this Cold War-era warrior! 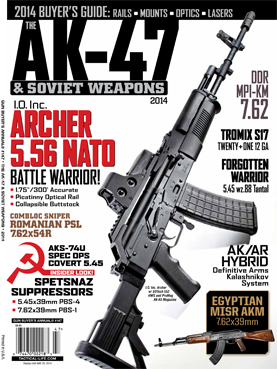 A compact 7.62x39mm AK for the ultimate in last-ditch, close-quarters defense! Larry Vickers’ AK Operators Class delivers Delta Force-born training and tactics! Advanced conversion system — 5.56mm AR technology with AK durability! Spetsnaz-proven compact enforcer packing 5.45x39mm firepower! U.S.-made 7.62x39mm from Century Arms offers a modern take on a classic design! Movies to television, the Kalashnikov has been a high-profile presence in entertainment. Predecessor to the AK-47, these 7.62x39mm carbines hold their own on the battlefield! An American-perfected 7.62x39mm Russian AK with outstanding accuracy! ComBloc sniper rifle offers Kalashnikov reliability with precision, power, and range! Poland’s concealable Cold War 9x18mm sidearm for close-range defense! Delivering custom U.S.-made receivers for your specialized AK build! This entry was posted in 2010, AK Books, Athlon Media, Magazine by gwebs. Bookmark the permalink.